BEFORE I FORGET AGAIN ..... hello to the wonderful Mandy Barwick and here's hoping you're well on your way to recovery after an exhausting operation for breast cancer. My thoughts and best wishes are with you. BEFORE I FORGET IN ADVANCE .... thank you to @MargoJMilne and @sarahransley (the Hinge & Brackett of Twitter) for their offer to write a blog entry to help us understand more about a 'day in the life of someone with a sense of humour & MS'. Whenever you are ready ladies; you know the art of the possible better than I. FINALLY ......... At the risk of sounding like a broken record, I'm running one more fundraiser this year to get me shifted past the £10 000 barrier and that fundraiser is at Harrogate Restaurant Bar & Grill. See leaflet below. 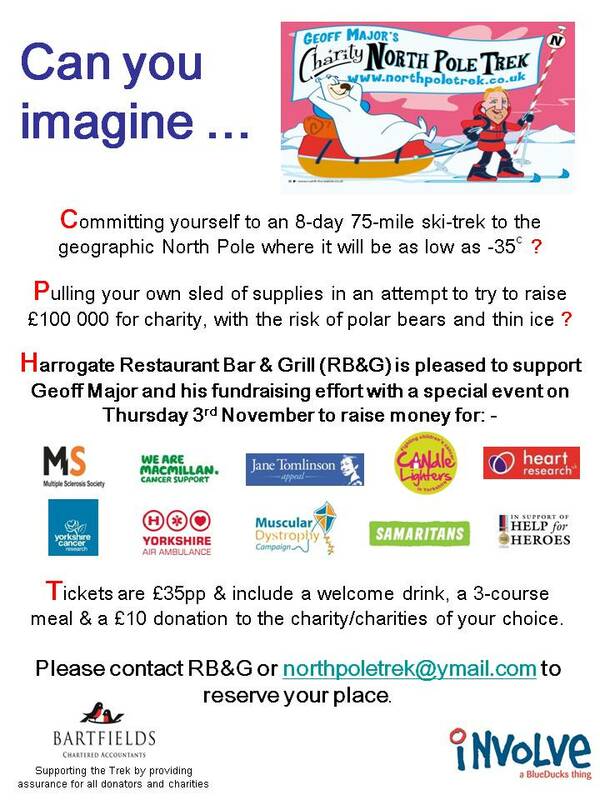 Thank you to Anna 'risky' Fitzsimmons for her amazing help and generosity at reducing the cost of a special menu and guys, a trip to the fundraiser is well worth the effort as Glenn the 'sharpshooter' is suggesting Anna puts herself up as a dinner date for a silent auction prize - someone already offered £5000 if she wears a ski outfit (and no it wasn't me). So, back to the thorny issue of fundraising; when my Mum, at 79, became my 8th biggest source of donation (after asking at her indoor bowls club members for sponsorship and getting over £100 in total), and my boss offers to bake a cake to help it's all a bit sad from my perspective so I'm doing this event then taking 2 months off to focus on training. Sod the low response to fundraising, Sod it if MacMillan Cancer Support offered me 8 days of collecting at supermarkets but all I could get was 3 volunteers (although thanks also to Tina Bonetta for TRYING to get a weekend drinking in Leeds aligned to collection opportunities) - I mean I have to learn to ski and shoot and train bloodt hard and see my friends but most importantly my fantastic two girls and Lucia (and my Mum of course) - and work !! Sod the fact that 4 different volunteers, different to the supermarket ones, stepped forward and then stepped back. It's ok, they have busy lives too and they haven't committed £26 000 of their own earnings to pay for the Trek of a lifetime. I did and I set the aspirational target of £100 000 for charity thinking it would be possible. I mean it's not as if I'm just trying to organise a tea party or taking part in a 6k fun run - THIS IS THE NORTH BLOODY POLE I'M GOING TO !!!!!!!!! It's late and that's the excuse I'm sticking to right now. a) An event in Leeds, late January 2012 (probably at 'Create', the social enterprise restaurant). b) An event at Piccolino's in Sheffield, February 2012, where my friends and I will ABSOLUTELY fill all 120 seats and generate the best fundraiser ever in my fundraising history !!!! c) The stand at the 2-day Yorkshire Mafia Conference and Exhibition in March, just 2 weeks before I leave for the Pole. Thank you Geoff Shepherd and Sat Mann for your amazing and undying support and efforts regarding my charity challenge. d) A goodbye event at Zinc in Manchester, a week before I leave for the Pole. e) The amazing work Smiles SMS have done to line up 60 organisations and counting to promote my Trek in March and April 2012.